Extreme headline maybe, but this recent article that came out by the New Statesmen, Britain’s Current Affairs & Politics Magazine, certainly raises an important point about the risks with spreadsheet software. While it may seem a stretch that Excel is the most dangerous software in the world, it does point out the inherent risks as seen with the $9 billion loss by JPMorgan that was partly due to an Excel spreadsheet modeling mistake. Spreadsheets are not collaborative, there is no audit trail, and they are prone to human error when mistakes are made in assumptions and calculations, or simply cutting and pasting. The issue for many organizations who continue to manage critical financial data using Excel spreadsheets is that there is no safety check that automated corporate performance management systems provide. A CFO article from May 2012 estimates that more than 70% of global executives use spreadsheets to track and manage financial reporting on a daily basis. That is a big risk companies are taking with financial data and reporting the true picture. We believe the past recession and continued uncertainty in the global economy requires organizations to get serious about automation and security. 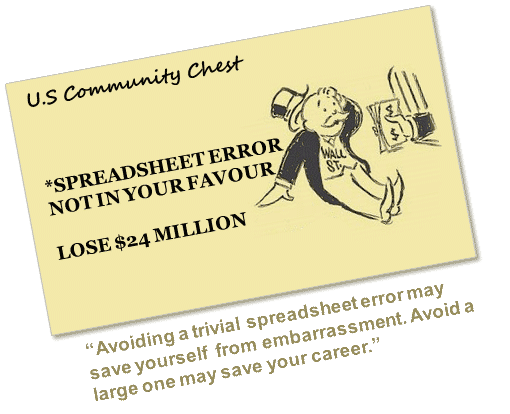 At a certain point, someone is going to take the fall if procedures and systems are not in place to prevent Excel spreadsheet errors having big consequences.